Megalosaurus represents a very important genus within the Dinosauria cladogram. As a meat-eater it is part of the theropod group and as a family, the Megalosaurs tend to be overshadowed by their more illustrious relatives the Tyrannosaurs, Maniraptoriformes and Allosaurs. However, Megalosaurus will still hold a special place in the hearts of scientists as it was the first Dinosaur to be named and described. This momentous event took place in 1824, nearly 20 years before the name Dinosaur was invented. An English clergyman and geologist the Reverend William Buckland was appointed to examine and review a piece of fossilised lower jaw plus a number of other strange fossil bones which had been found in quarries in Oxfordshire. He had been aware of these bones for a number of years and collected several specimens himself. In his review, William Buckland incorporated studies of upper and lower limb bones, parts of the pelvis, scapula and vertebrae. It was the lower jaw that played the most important role in his studies. Although the bones were assumed to come from the same genus, but from different individuals, it was the lower jaw that was most striking. The teeth were different from any other living animals, known to science at the time and the jaw had a number of teeth embedded within it ready to emerge, replacing older teeth in the jaw. Identifying the fossils as belonging to a reptile, William Buckland used living lizards anatomy to estimate the size of this new animal. 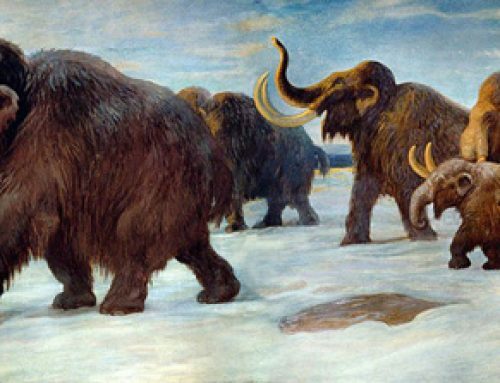 He calculated that the creature was over 13 metres in Length (in excess of 40 feet), and would have weighed more than an elephant. In the light of this evidence the name Megalosaurus (means huge or great lizard) was adopted, although the name had been already ascribed to this animal by another British scientist – James Parkinson two years earlier. The Reverend Buckland’s article contained five beautifully detailed lithographic plates that depicted the fossils. Special attention was paid to illustrating the jaw fragment, as Buckland understood the significance of this particular find. Even today, skull bones, teeth and jaws are the prize finds for palaeontologists as they can tell them so much about the animal’s lifestyle and possible relationships to other dinosaur species. On one plate Buckland provided views of the inside (lingual view – what the teeth look like facing the tongue) and the outside (labial view – what the teeth look like when viewed from the side that would have faced the lips). These were drawn at 1/2 scale but in addition he provided a fold out section within his paper that illustrated the lingual view of the jaw at full size. Perhaps he was aware of the need to demonstrate the size of the animal using this full size drawing with its socket-ed teeth, or maybe this additional illustration was added to give a “flourish” to his work. Certainly, in the scientific circles of the gentry in the 1820s a bit of “embellishment” was quite common place. Ironically, William Buckland in his published paper never actually stated that the jawbone came from a carnivore, an obvious deduction given the shape and size of the teeth, but in the final print of his work, this fact was not included. Little is known about Megalosaurus, with very few finds of this type of Jurassic carnivore being made to add to our knowledge. In fact, for much of the 19th and early 20th Centuries many partial fossils and fragments from carnivores discovered in Europe were assigned to the genus Megalosaurus. So many finds were labelled as belonging to Megalosaurs that this genera became known as “a Dinosaur Waste Basket” with virtually every indeterminate piece of carnosaur fossil being placed within this group. It is only in the last few years, as our knowledge of European theropods has improved that scientists have taken a fresh look at these “Megalosaurus bones” and have begun to sort them out into other genera. Megalosaurus was one of the top predators around at the time, it reached lengths of around 9 metres and weighed approximately 1 tonne. As a result, a number of Megalosaurus dinosaur models have been produced. It remains a favourite amongst model collectors and dinosaur enthusiasts and in recognition of this it was one of the first dinosaurs commissioned by the Natural History museum when they created their own model collection.